KANSAS CITY, KS--(Marketwire - March 8, 2011) - In keeping with its innovative approach to nonprofit management, LIVESTRONG today announced that it has partnered with Kansas City-based Sporting Club to name its stadium and event complex "LIVESTRONG Sporting Park." Sporting Club, the parent organization of Sporting Kansas City of Major League Soccer, will host a variety of sports and entertainment events at the new stadium, including all home matches for the soccer team. Through this unique partnership, fans will join the fight against cancer every time they support their teams or enjoy memorable performances at the venue. LIVESTRONG is the brand of the Lance Armstrong Foundation, created in 1997 by the cancer survivor and champion cyclist to serve people living with cancer and empower communities to take action. For the duration of the agreement, a portion of all stadium revenues, including ticket sales and concessions, will fund the foundation's advocacy work. The partnership will also help launch the development of local cancer survivorship services for Kansas City residents. The Lance Armstrong Foundation continually seeks out innovative business strategies and partnerships that will further its mission to serve people affected by cancer and empower them to take action. LIVESTRONG's sporting and athletic heritage make for a natural partnership with Sporting Club and provide a unique opportunity for these organizations to spread cancer awareness throughout the Kansas City community. LIVESTRONG Sporting Park will seat 18,500 for soccer and 25,000 for concerts. The $200 million stadium will be one of the most technologically advanced stadiums in the United States and will focus on fan experience through WiFi Access, multiple themed club environments, an IP television network and a membership affinity platform. In addition, the stadium and accompanying event complex will also be 100 percent tobacco free. For more information about the stadium, visit www.LIVESTRONGSportingPark.com. LIVESTRONG serves people affected by cancer and empowers them to take action against the world's leading cause of death. Created as the Lance Armstrong Foundation in 1997 by cancer survivor and champion cyclist Lance Armstrong, the organization is now known publicly by its powerful brand - LIVESTRONG - and is a leader in the global movement on behalf of 28 million people around the world living with cancer today. Known for its iconic yellow wristband, LIVESTRONG has become a symbol of hope and inspiration to people affected by cancer around the world. Since its inception, the organization has raised more than $400 million for the fight against cancer. LIVESTRONG.org. Sporting Club is owned by a group of local Kansas City business and community leaders comprised of Neal Patterson, Cliff Illig, Pat Curran, Greg Maday and Robb Heineman. Its flagship Major League Soccer property, Sporting Kansas City, is the only locally owned professional sports team in the city and the club prides itself on its commitment and innovative vision to provide high-performance entertainment and consumer experiences. Sporting Club purchased the team from the Hunt Sports Group in 2006, and under their direction have opened a world-class training center at Swope Park, invested heavily in the Sporting Kansas City Juniors Development Academy, and brought some of the top teams from around the world to play in Kansas City, including Manchester United, Chivas Guadalajara and the U.S. Men's National Team. Founded in 1996 as an original charter member of Major League Soccer, Sporting Kansas City enters its 16th season in 2011 with a state-of-the-art, $200 million plus stadium to open in June and the launch of a ground-breaking membership model that will transform the way a professional sports team connects with its supporters. For more information on Sporting Club, visit SportingKC.com. 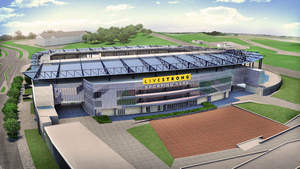 Rendering of LIVESTRONG Sporting Park in Kansas City, KS, the first athletic venue in the world with a social change mission. The stadium and event complex will open on June 9 and will champion the fight against cancer.